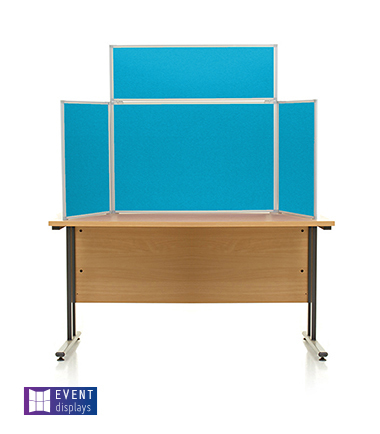 Table top display boards are a versatile display system which can accompany you virtually anywhere. These table display stands are small and compact in size and they are designed to help your content to stand out. We have a variety of designs available, with features such as landscape central panels or panel headers available. Each can be tailored to suit your needs and aspects such as the fabric colour can be customised. With the materials we use when manufacturing the table top display boards, they are suitable for use in any indoor location. The panel incorporates an intuitive core which is incredibly sturdy and this helps to secure the table display stands and your content once it is set up. Therefore, these display boards are an effective display tool for use in at exhibitions, trade shows, school displays and much more. We are able create a high quality system which is going to deliver every time by designing and manufacturing them ourselves at our premises in Peterborough, Cambridgeshire. Every design, every specification can be tailored and tweaked before you order, providing you with breathing room to create a display system which is adapted to your content. There is also a manufacturer's guarantee included with all the display boards that we produce.